Service Areas along highways are rare or non-existent. There are few on A20 (close to Messina) and on A18 so make sure you have enough of gas to reach your destination. Obviously, you can always exit the highway and find gas station in nearby town, but this is a tremendous waste of time! 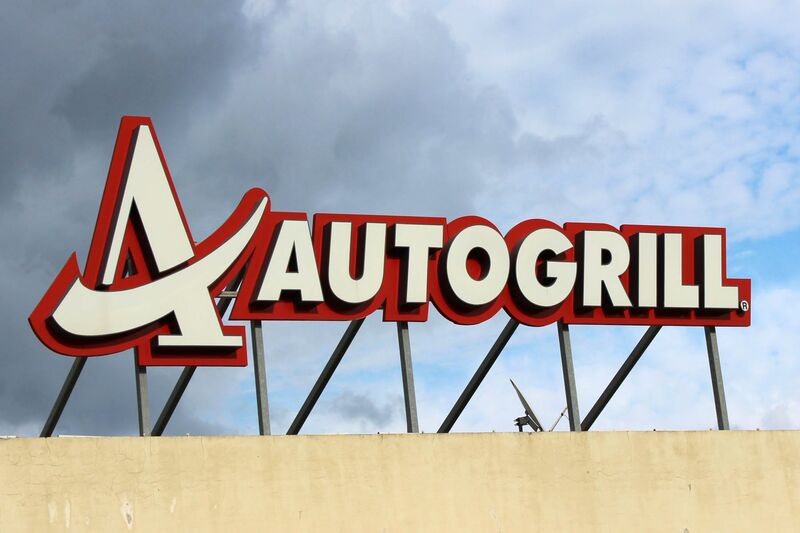 If you are lucky (mostly on A18) – service areas may include Autogrill. It’s an Italian chain of highway stores, usually providing good choice of hot meals, freshly brewed coffee, sweets and plenty of non-food items. Unfortunately Sicilian Autogrills are quite “poor” compared to their Italian Mainland’s counterparts. Contrary to US and Canada (where pumps have single nozzle for different fuel grades selected by a button), in Europe pumps have separate nozzles for different types and grades of fuel. To make it easier – nozzles are color-coded: black nozzle for diesel fuel, green nozzle for lower-grade gasoline (95) and red nozzle for higher-grade gasoline (98). These days only unleaded gasoline (It: benzina senza piombo) is available at the pumps. Many highway gas stations (but also these on countryside roads and in the cities) are closed or unattended for midday siesta, nights and weekends (Sundays). No panic - during that time they may still offer self-service. 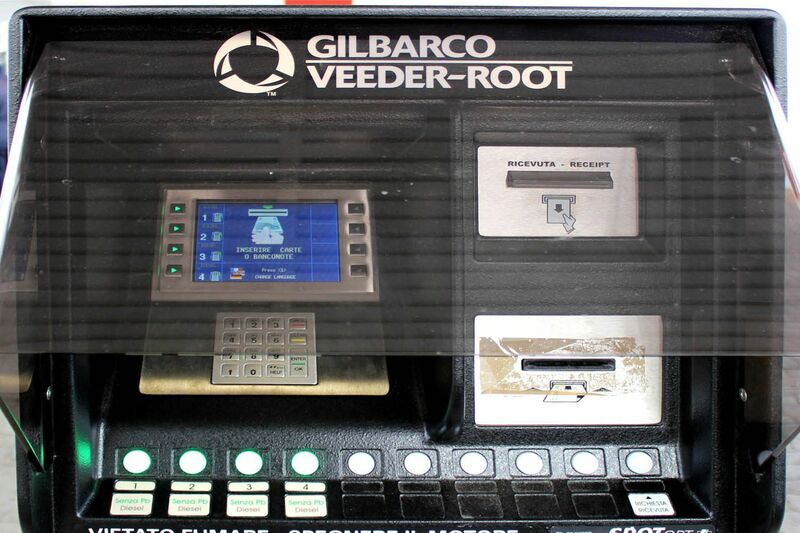 But there is a caveat - you cannot use your American credit card in gas-vending machines (you need the PIN# for transaction). As usually - cash (Euros) will do the job! 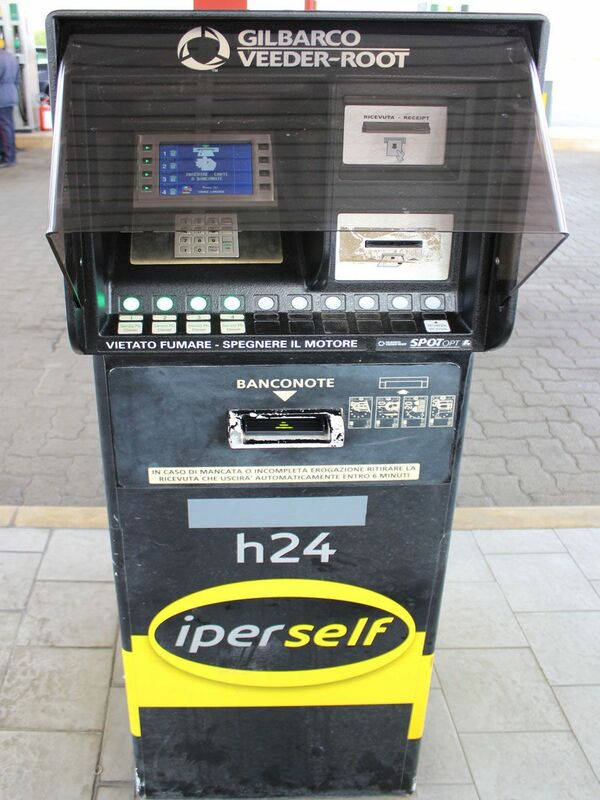 When using self-serviced pump, put bill (€) into machine and select the pump number you want to activate (usually one machine serves all pumps). Keep in mind that you will not get change, so you have to have “right” bill(s). Do not put large bills; start with 10-20 Euros to make sure that the machine works (it happened to me that it “swallowed” my 20€ but not delivered even one drop of gas! Also, pay attention to the selected pump number (should be the one next to your car). If you make mistake, someone else may “gracefully” fill the tank with your gas before you will realize what happens. Urban areas - 31 mph (50km/h). Countryside roads - 56 mph (90 km/h); some “fast” sections may have limit up to 68 mph (110km/h) but is must be specifically indicated by the corresponding road signs. Highway (Autostrada) – 81 mph (130 km/h). Compared to US where the typical maximum speed on highways is only 65 mph (105 km/h) this limit let you fly! Usually in tunnels and on bridges speed limits are reduced to about 50 mph (80km/h). In such cases “local” limits will be displayed by the road signs. Along the highways you will also find signs showing reduced speed limits for driving in foggy/misty conditions (It: Nebbia). Do not underestimate these limits regardless of how low they seem to be! Doesn’t matter how fast you will drive, there will be always someone driving faster. 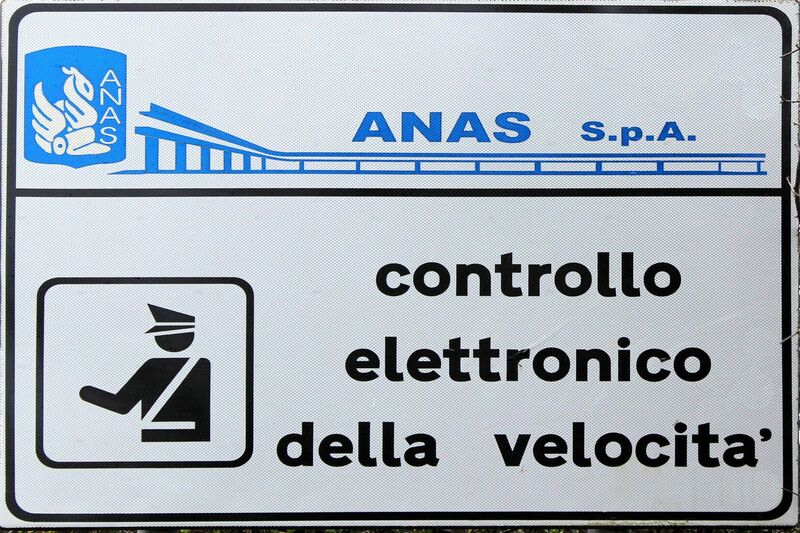 And frankly, you have very little chances to impress Sicilian drivers. You should know that Sicily is a home to one of the world’s oldest open-road car races. Since 1906 for over seventy years the legendary Targa Florio was run on Sicilian roads! Sicily may be the largest island on the Mediterranean Sea, but hey, by all accounts it is still a small piece of land. With its area of 9,927 square miles it is about the size of Vermont. The bottom line – you do not have to cruise at the “supersonic speed”. Driving within the speed limits you will not only be on the “safe side” and “on time” at your destination, but also will have opportunity to enjoy fantastic countryside scenery! Speed limits are enforced not only by police patrol cars (easier to spot), but also by system of more or less “hidden” radars implanted along the roads. You may have hard time to see them, but the opposite is not true. They work “quietly” and the follow-up is also soundless although it may trigger your “loud” reaction once you see an extra charge on your credit card or a ticket in your mailbox! When it comes to worst and you are caught by cops, do not worry. They are friendly, may talk a lot and let you get out of your car, but certainly they will not force you to lie down on the road or shoot …. 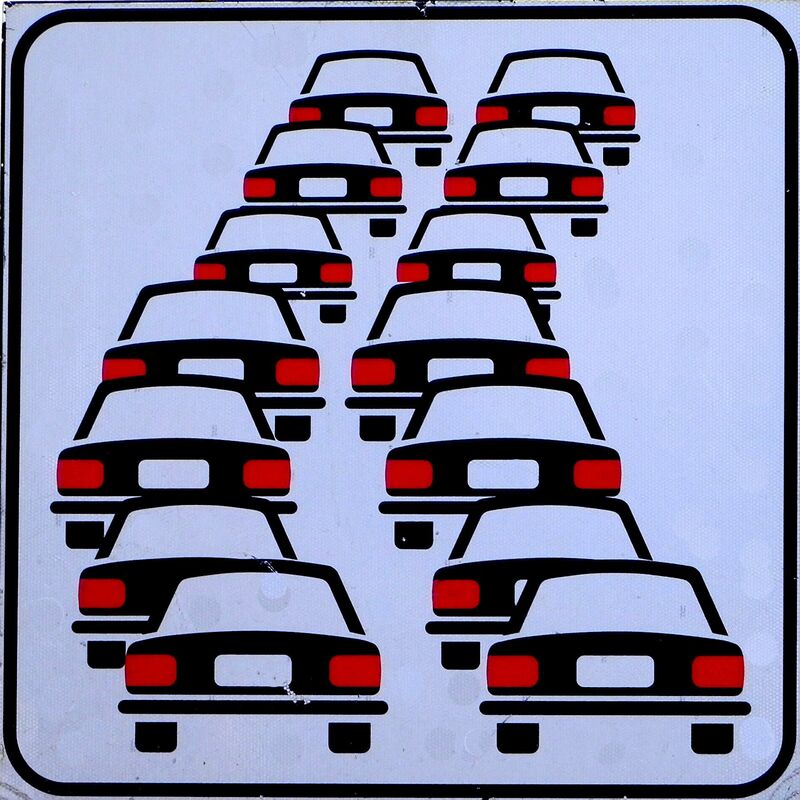 On highways keep driving on the right lane, the left (fast) lane should be used only for passing. 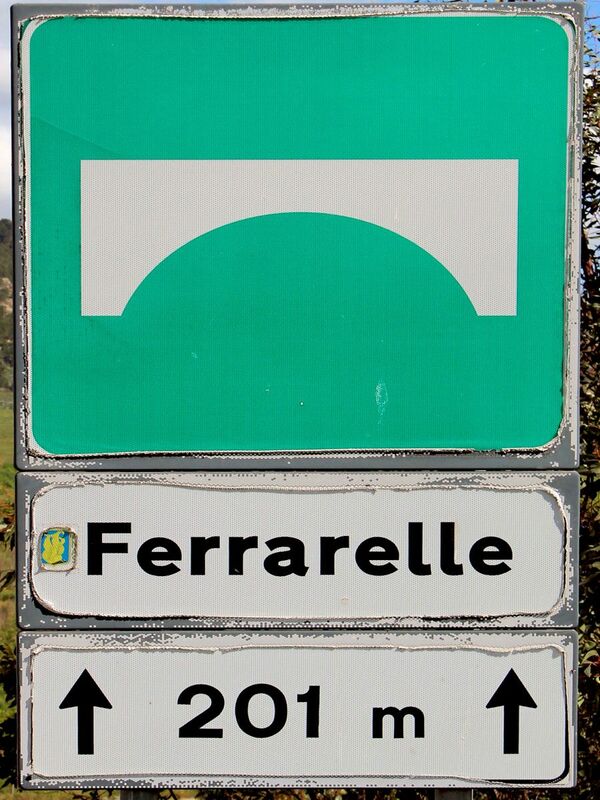 In Sicily it is actually taken very seriously – the left lane is “sacred”! 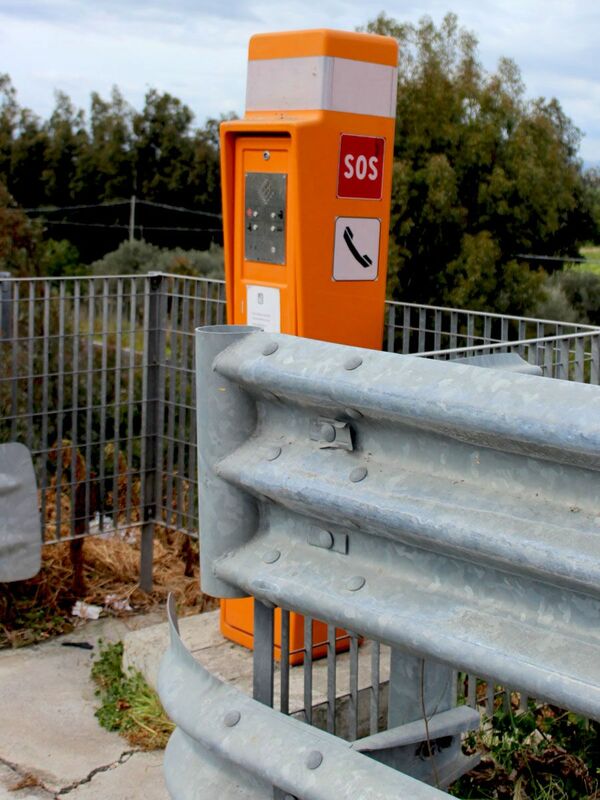 Service areas are rare on Sicilian highways, fortunately quite often along the road you will find small parking areas where you can have no-emergency stop. 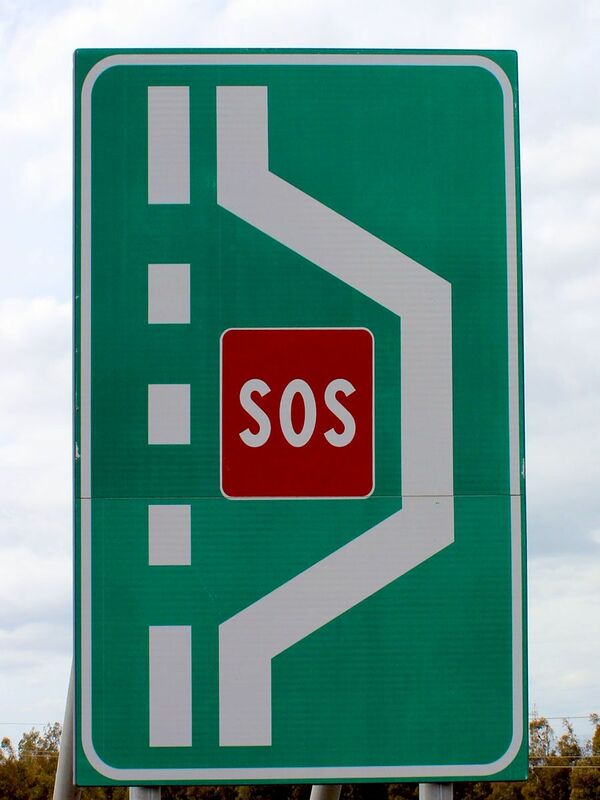 Some parking areas have SOS Phone Service. In case of emergency it may be better solution than your own cellphone (especially if you do not speak Italian). Most of them are self-explanatory. Next to the pictures you will find some comments.